Interview with Bob Fredregill conducted August 2011. In the mid 1960s brothers Jim and Bob Fredregill were looking for a franchise opportunity. "Both of us had worked in restaurants," Bob Fredregill said. "Our company, that was started in 1962, managed restaurants for absentee owners. Most of the those were in the mountains, like the Red Lion Inn in Vail, but we also had management contracts in Denver." Originally from Sterling, the two set their sights on Pueblo, where they would open the city's first Red Barn restaurant. "Red Barn was a franchise establishment started by a group of men from Ohio. We thought it was very innovative, and we were excited by the concept. They had an expanded menu, with not only hamburgers, but also chicken and fish." 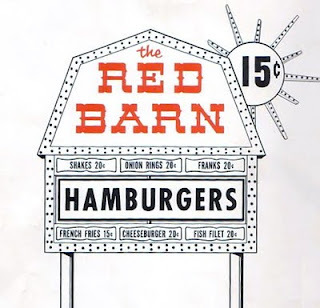 On Nov. 1, 1966 the first Red Barn was opened at 215 E. Abriendo. The following year a second location started serving customers in the Belmont Shopping Center, on Bonforte. The chain was an instant success, with hungry diners lining up for the diverse menu options, including Big Barney or Barnbuster burgers, $.99 fried chicken, and fish sandwiches. The Red Barn capitalized on their diverse menu (and its instant appeal to children) with three mascots, Hamburger Hungry (complete with hamburger head), Fried Chicken Hungry (a chicken leg) and Big Fish Hungry (a blue fish). 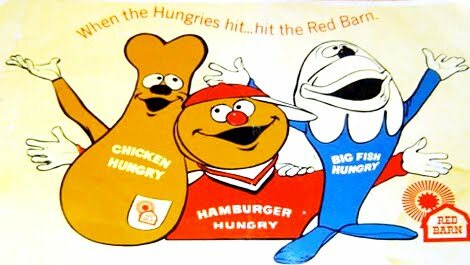 "We actually had our own Hamburger Hungry costume," said Fredregill. "We would enter the State Fair parade driving a golf cart, with someone dressed in the costume. It was a fun attention-getter, but very hot to wear in the summer months." 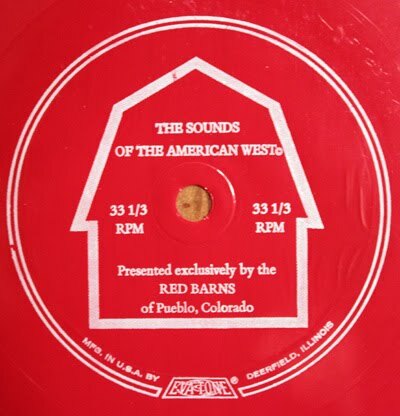 Before Burger King patrons ever learned the lyrics to "Hold the pickles, hold the lettuce," The Red Barn had their own catchy jingle, "When the hungries hit / When the hungries hit / Hit the Red Barn." By 1974 the brothers opened their third location, in the Sunset Shopping Center on South Prairie. Like many other family food chains, the Red Barn offered premiums to its customers. In the early stages of the restaurant, plastic hand puppets, yo-yos, comic books, plastic cups, and kites were popular with children. Enlisting the help of local marketer, Jack Holden, the Pueblo chain branched out with its own promotional give-aways. 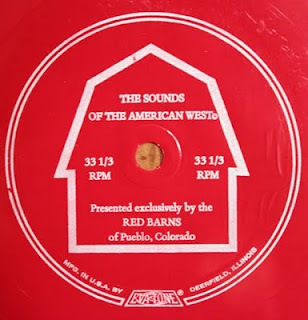 In 1969 the Pueblo Red Barn franchise release a red flexi disc, entitled "Sounds of The American West." 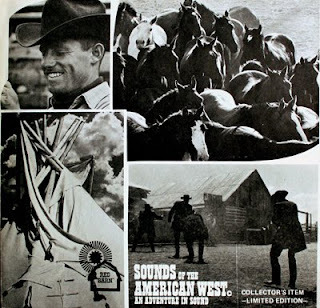 Listen to a sample of "Sounds of the American West"
The 33 1/3 single, complete with life on the range sound effects, was narrated by a folksy storyteller who managed to sneak in a few mentions of the restaurant's signature food items. (Dinner bell sound effects) "You know there weren't any Red Barn restaurants handy like there are now, so we had to chop our own wood, and mother had to cook over an unpredictable wood stove. But it tasted all pretty darn good, all the same. What I wouldn't have given for a delicious Big Barney." Fredregill doesn't recollect the specifics of how the promotional record came about, who recorded it, or how many were made. The paper cover of the flexi was covered with scenes of the west, from noted Southern Colorado photographer, John Suhay. In 2010 Suhay was honored by The Sangre de Cristo Arts and Conference Center as photographer emeritus. It wouldn't be the last time the restaurant offered a record. "Remember the old jingle for Coke ["I'd Like to Teach The World to Sing"]? Well, we got a whole bunch of those records and gave those out as a premium, with a sandwich and coke. But Coke found about it, and said we couldn't do it." By the 1970s, glassware replaced records as the more popular premium offerings to customers. 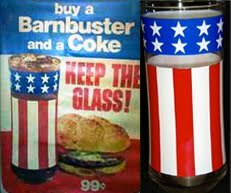 "One of the biggest promotions we had was our patriotic glasses we had in 1976. Those were very popular." By the late 1970s, the Red Barn company changed hands, and sold to Servomation, who later sold it to Motel 6. The new owners ceased advertising for the chain and the franchise leases were allowed to expire with the last of the leases expiring around 1986. At its peak, Red Barn had 400 restaurants in 19 states. "We closed the one in the Sunset Shopping Center a couple of years after we opened it - it just wasn't a good location. We broke our franchise in 1979, and renamed the two we had left J.R Poteet's, after a character in James Michener's Centennial [trail boss R.J. Poteet]. We ran it that way for two years. We kept the same concept, and made a few changes. Then in 1981 Paul Jones and Sam Sharp, who owned Loaf and Jug, bought the business." While the Red Barn is no more, there are numerous remnants of the restaurant. Most of the distinctive Red Barn buildings were converted for other uses. While the Belmont location is gone, the Abriendo building is now a Mexi-Deli. By 1972 the brothers started a catering business in town. In 1974 Jim and Bob Fredregill purchased an old church at the corner of Michigan and Routt, in the Mesa Junction area of Pueblo, a few blocks from Central High School. The property would be used for office and kitchen space for their expanding businesses. After refurbishing the structure, the Fredregills opened the upscale La Renaissance Restaurant in 1978. This year marks their 33rd year in business. 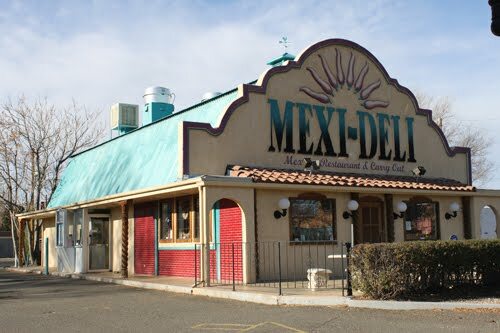 "We came to Pueblo to start the business. It’s a great town, a good place to raise a family, and we just stayed."